@BifBangPow: Live, from New York, It's The Ambiguously Gay Duo! Live, from New York, It's The Ambiguously Gay Duo! We are proud to announce the latest in our Saturday Night Live line of products: SNL The Ambiguously Gay Duo Monitor Mate - A Convention Exclusive! 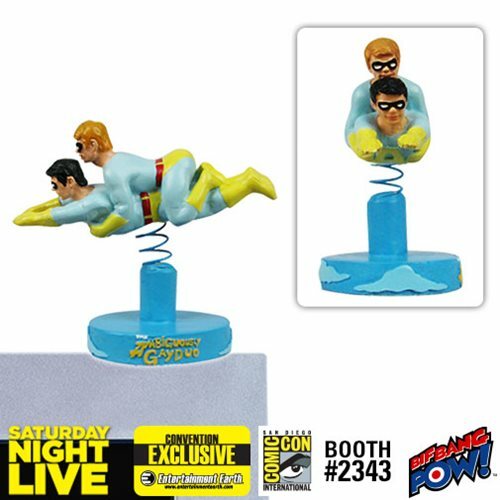 That fearless crime-fighting team of Ace and Gary, The Ambiguously Gay Duo, is coming to your computer monitor, straight from the hilarious Saturday Night Live cartoon, and featuring the voices of famous funny men Stephen Colbert and Steve Carell as Ace and Gary! The mini bobble head monitor mate measures about 3 1/4-inches long x 2 1/2-inches tall, with Gary (Steve Carell) fearlessly riding on Ace's (Stephen Colbert) back as the duo flies to an emergency, perhaps to fight their arch-nemesis, Bighead, or to visit their Fortress of Privacy! "The Ambiguously Gay Duo" cloud-themed logo base sticks to your computer monitor with a non-damaging adhesive pad. Elevated above the base, Ace and Gary bobble as one.